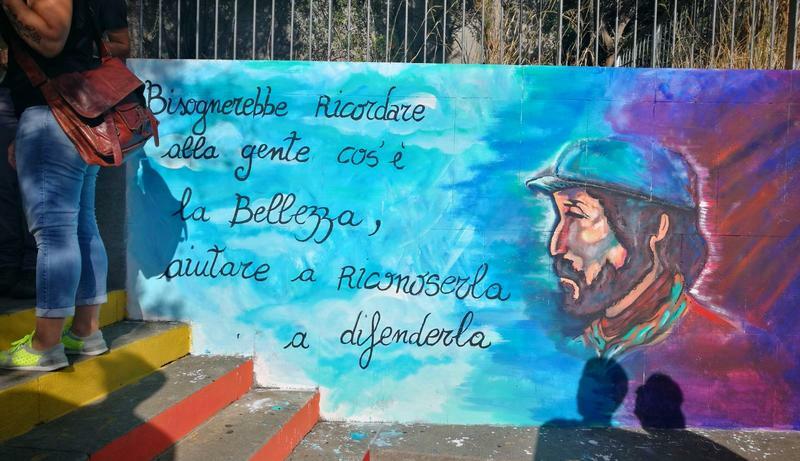 Anti-mafia activists and ordinary citizens marched Wednesday to the Sicilian town of Cinisi to honor the 40th anniversary of the death of anti-Mafia activist Giuseppe (Peppino) Impastato. The march was organised by the ‘memorial home‘ dedicated to the memory of Impastato and his mother Felicia, who fought tirelessly to have Cosa Nostra found guilty of her son’s murder. Impastato, a leftist militant and radio DJ, rebelled against his Mafia father in 1968 and courageously denounced a powerful and murderous nearby clan boss, Gaetano ‘Tano’ Badalamenti, who brutally killed Impastato and staged his death to look like he blew himself up while planting a bomb. Badalamenti was finally indicted for the murder 20 years later. The memorial home also organised a rally in the farmhouse in the countryside where Impastato was killed. Marchers also walked from the old offices of Impastato’s Radio Aut in Terrasini to his former home in Cinisi. “2018 is a very important year,” said his brother Giovanni.”On the 40th anniversary of the mafia murder of Peppino Impastato we want to pass on the baton, involving an entire generation with his message, which was not only that of civic commitment and political struggle, but also an educational message for all the young people who still want to change the world”. Impastato was the subject of a well-received book and film I Cento Passi (The 100 Steps), referring to the distance between Impastato’s home and Badalamenti’s. Badalementi, who died in a US jail serving 45 years for the Pizza Connection case in 2004, was convicted of the murder along with the mafioso who actually carried it out, Vito Palazzolo. Also Wednesday, Italy held ceremonies to mark Victims of Terrorism Day, commemorating the thousands of people who lost their lives at the hands of leftist and rightist militants during the so-called Years of Lead in the 1970s and ’80s. This entry was posted in Education and social prevention, Europe, Human rights, Illegal economy and organised crime, Italy, mafia, Memory, Memory and victims suport and tagged antimafia, Europe, human rights, human rights defender, Italy, Memory and Commitment Journeys, victims. Bookmark the permalink. ← New law to strenghten whistleblower protection by the European Commission !